Out of all the different furniture companies in the world, K+N is one of the only ones that is owned and operated entirely by the owner and manager, rather than on the stock exchange. Since it was established in 1925, K+N has grown to have seven showrooms and two production sites in just 88 years. They also have international branches located in the Netherlands and England, even though their headquarters are located in Karben, Germany. K+N operates to maximum efficiency using their own K+N system, a holistic approach to construction that is unbeaten by any other furniture company. It all starts with the individual design needs from the client, combined with detailed knowledge, economic efficiency and a lot of motivation to produce a unique solution to your office problems. K+N strive for office workspaces that encourage contented workers and high performance. Since the year 2009, one of K+N’s passions has been to invest time, money and research into more efficient methods of production. This helps to minimise costs on the client’s part, but also helps to produce more top quality furniture. K+N pride themselves on being able to react quickly and efficiently to changes in customer needs and market requirements. K+N strongly believes that the design and layout of your office can have a big impact on the performance and motivation of your employees, which is why the layout of an office should be considered carefully before building. Through open plan designs and the use of ergonomic office furniture, K+N constantly strive to improve performance and motivation through their products. The reception area of any company is a central point for advice and information for visitors and possibly future clients, which is why it is important that reception area furniture is open, inviting but also professional. First impressions are key to the success of any business. K+N understand this and use only the most high quality materials in building reception desks and always turn to you first for your design input. When you’re sitting at a desk all day, you’ll need the very best office furniture available, which K+N can supply. Their Basic workstation package offers everything you need: a simple and appealing design with a high amount of functionality. The construction of this package allows the workstation to be re-constructed and upgraded if your needs ever change. K+N offer several different office storage systems that are fully adaptable depending on your needs. Your needs and requirements are fully considered when producing storage designs that are clever and aesthetically pleasing. One of K+N’s best selling systems is the Acta Classic system, which is a free standing range of cupboards that can incorporate both shelves and filing. 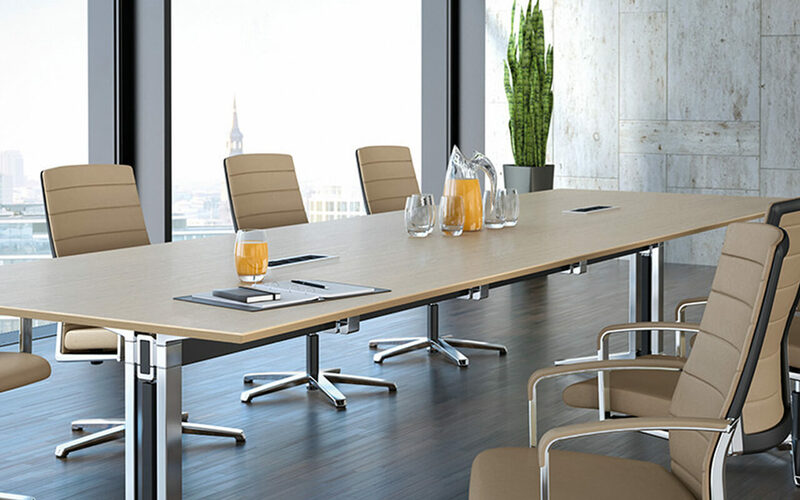 Depending on your tastes and the style of your office, you can choose from solid wood or metal. If you’re trying to use your office space as efficiently as possible, then the Universal system is the one for you. With numerous different models and structures available, this storagewall system fits in perfectly with any room. Universal can also be adapted as office partitions. No two clients are exactly the same, which means that no two designs are the same. K+N work very closely with each of their clients to find out their exact design requirements and measurements. Because of the close relationship between the customer and company, K+N can offer incredibly competitive prices to suit any budget. K+N will be with you every step of the way to ensure you are 100% happy with your design. Here at Rapid Office, we have an excellent relationship with K+N. Contact us now for professional service, expert knowledge of the office furniture industry, and the latest products from this manufacturer.